Walking on Samoa Beach during a nor'wester a few stormy days ago, waves crashing towards the shore, I wondered if the Pacific Ocean had been named in irony -- 'pacific' was the last thing that came to mind. Turns out, though, that the man who named our western sea was dead serious -- and grateful. Although Ferdinand Magellan was Portuguese, he was actually in the service of the king of Spain, Charles V, when he gave the Pacific its name. Magellan had previously suffered a rather messy relationship with his native Portugal. Although he helped install a Portuguese viceroy in India, he was also accused (probably justly) of going AWOL and subsequently trading illegally with the Moors. In Magellan's time, Spain's problem was that the only known shipping route to the Indies (roughly, present-day Indonesia) was via the Cape of Good Hope. The right to that passage had -- unfortunately for Spain -- been granted to Portugal under the Treaty of Tordesillas, which divided the world into Spanish and Portuguese spheres of influence. So the enterprising Magellan proposed to Charles V that he would find another route by sailing west and south, until he found a way around the newly-discovered continent of South America. Charles bought the proposal and gave Magellan five ships, which sailed downriver from Seville in August 1519. 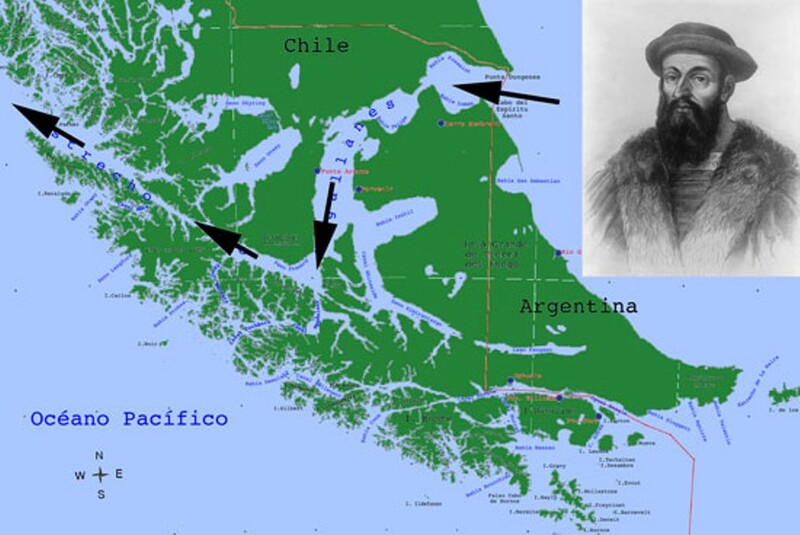 It was not a happy journey (Magellan had to put down a mutiny, among other trifles), but finally three of his ships became the first to sail through what is now called the Strait of Magellan, the 300-mile channel from the Atlantic and Pacific between Tierra del Fuego and the mainland. It was a rough, month-long trip through the strait (so rough that one of his remaining four ships deserted), but on November 28, 1520, his ships entered the comparatively calm waters of open sea. In gratitude, Magellan named the new ocean Mar Pacifico (Pacific Ocean). Magellan didn't have very long to savor his triumph. He was killed six months later in a skirmish with native people in the Philippines. Of 237 men who had set out in five ships to sail around the earth in 1519, only 18 completed the circumnavigation, finally limping back to Spain in 1522. The name of the ocean stuck, though, and I like to think that Magellan (or his ghost) would be happy to know that he'd been responsible for naming the largest body of water on Earth, not to mention the western boundary of Humboldt County. Barry Evans (barryevans9@yahoo.com) is a recovering civil engineer living in beautiful Old Town Eureka. His book "Everyday Wonders: Encounters with the Astonishing World around Us" led to a four-year stint as a science commentator on National Public Radio.